Bridging the Gap Between Scientists and Policy Makers: Whither Geospatial? Thus spoke President Barack Obama in his 2nd inaugural address, to the delight of many, if not most in the scientific community. Indeed, there are many societal problems across the world that increasingly revolve around science. These include pollution and waste management, pandemics and biosecurity, access to clean air and clean drinking water, response to and recovery from natural disasters, choices among energy resources (oil and gas versus nuclear versus “alternative”), and the loss of open space in urban areas, as well as biodiversity in rural areas. And yet, there is a tension between the world of science, which is focused on discovery, and the world of policy making, which is focused on decisions. In the US it does not help that less than 2% of Congress has a professional background in science [Otto, 2011]. Members of Congress are not as interested in science as they are in what science can do for society. They look to the scientific community to give them answers to help them make policy decisions. But the answers they seek are often simpler than the scientific community is able or willing to provide, given the complexity of Earth processes and the persisting gaps in our knowledge and ability to measure certain parameters. 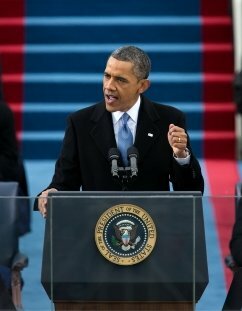 Policy makers live in a world that is extremely binary in comparison to scientists (e.g., casting a simple yes or no vote on a bill; a simple yes or no on a decision; standing for elections that are essentially driven by money and value-based issues that get citizens out to cast yes or no votes for or against them). Scientists are also used to communicating in a certain way, using their own specialized language and jargon that is often understood only among their peers. They may also be distrustful of how their results and interpretations may be used (or misused) outside of the traditional academic outlets of scientific journals and meetings. The academic world rewards scientists for participating in these activities, but not necessarily for reaching out to policy makers, the media, and the general public. And yet, the ramifications of the aforementioned critical societal challenges have become too great. Inaction by our governments on these issues will have dire consequences, and many in the scientific community are realizing that scientists can no longer afford to stand on the sidelines and not speak out beyond the boundaries of academe. What is the “new normal” in terms of the frequency of severe storms [Shepherd and Knox, 2012] and how can we be more adequately prepared; how can we more quickly catalyze solutions for the protection and the good of our societies? 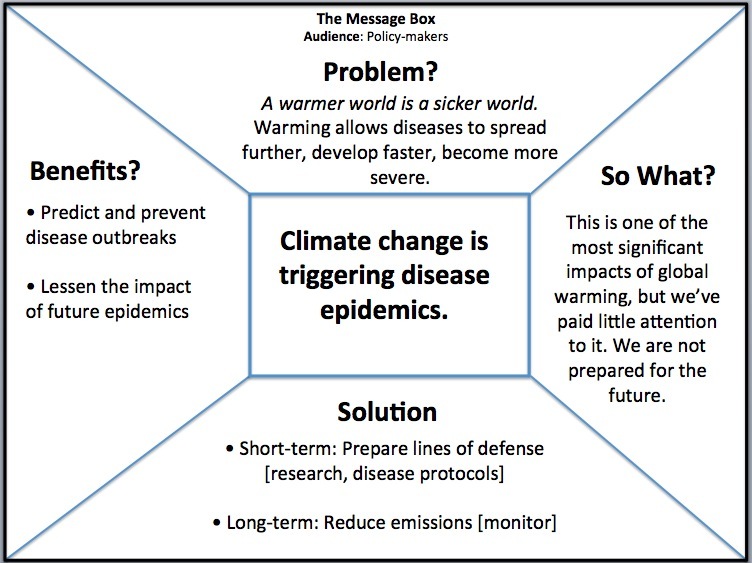 Indeed, science is now part of an unavoidable and contentious public discussion on a host of issues, including climate change and public health. Perhaps the clearest example of late is the conviction of six Italian scientists and a government official on multiple charges of manslaughter for failing to adequately communicate the risk of the L’Aquila earthquake that claimed the lives of more than 300 people in April 2009 [Cicerone and Nurse, 2012]. They were sentenced to six years in prison and ordered to pay a fine equivalent to US$10 million in damages. Goldman  discusses the many complexities of this case, including the important differences between communicating scientific uncertainty and communicating risk. The role of science in policy should be that of informing policy, not making policy. The culture of science is changing to the point that there is growing agreement that scientists can and should seek to engage with policy makers, and many have already been called up by policy makers to do so [e.g., Baron 2011]. And increasingly, scientists as communicators are moving into positions of administrative leadership, where they not only continue to engage with society in various ways, but also working to change the culture of academic institutions from within. Many are devoted to developing strategic thinking and science communication outreach skills in their graduate students and young faculty, exposing them to issues not typically covered in the classroom or in research training. What resources are available to scientists to help them become effective communicators to policy makers, especially in light of the already huge demands on their time? Special sessions on science communication and science informing policy are now being held regularly at prominent scientific meetings such as the annual meeting of the American Association for the Advancement of Science (AAAS), the world’s largest general scientific society, and the Fall Meeting of the American Geophysical Union (AGU), which hosts 20,000 attendees annually. To wit, the 2012 Fall AGU meeting featured workshops entitled Climate Communication: Tools and Tips and Finding Your Voice: Effective Science Communication. I am co-organizer of a session this week at the AAAS entitled The Beauty and Benefits of Escaping the Ivory Tower, that’s part of a broader theme of exciting sessions on science communication. Along similar lines, scholars from the University of California, Santa Barbara will present a paper this spring at the American Association of Geographers Annual Meeting entitled, What Can You Learn About Climate Change by Following the News? Themes and Frames in US News Reports, 1970s to Present. Message box (after Patz et al. ) aimed at policy makers and focused on climate science. The message box below has a slightly different audience. It distills a 15-page GIScience research proposal funded by a federal agency into a salient message for a journalist interested in developing a feature article on the project. 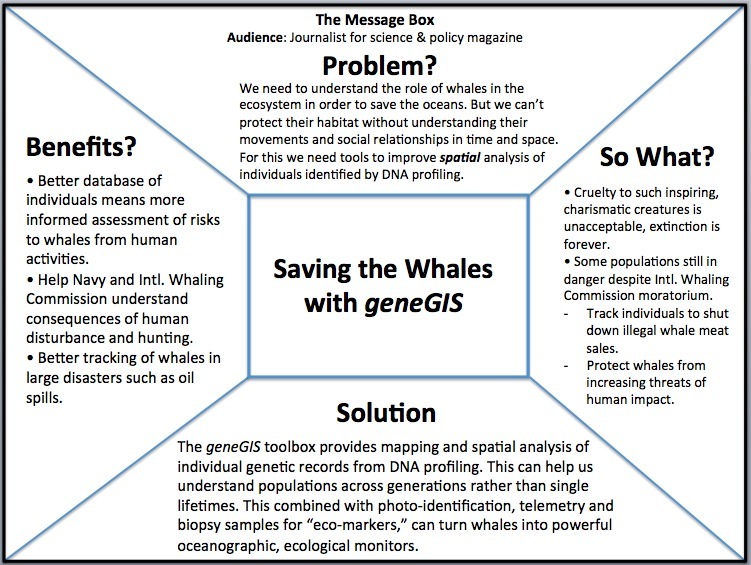 Message box aimed at a science journalist, and focused on GIS for marine mammal conservation. Staffers of COMPASS are also regular trainers in the Leopold Leadership Program at Stanford University’s Woods Institute for the Environment, which helps outstanding academic environmental researchers gain the tools and connections needed to translate their knowledge into action through engagement with media, government, NGOs, and business. Scientists chosen as fellows receive intensive experiential training and expert consultation in leadership and communication, including practice media interviews and meetings with policy makers in Washington, DC. After completion of the program, the new cohort joins other fellows in the Leopold Leadership Network, a community of academic scientists and former fellows who continue to communicate scientific information about environmental issues to policy makers and other non-scientists. Current fellows include members of the National Academy of Sciences, National Geographic Explorers-in-Residence, TED speakers, and top advisers to the nation via the National Academies of Science or Federal Advisory Committees. Another effective tool is the Esri “Story Map” which combines the new medium of “intelligent web maps” with text, multimedia content, and intuitive user experiences to inform, educate, entertain, and inspire many audiences about a wide variety of environmental issues, including policy makers. 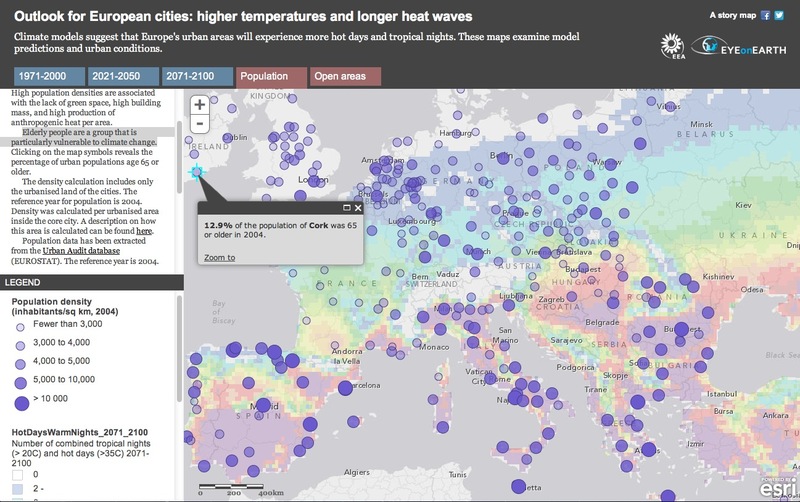 The example below shows a Story Map developed in collaboration with the European Environment Agency (EEA) and the Eye on Earth Network that allows examination of climate model predictions suggesting that Europe’s urban areas will experience more hot days and tropical nights in the period 2071-2100. Clearly this should be of interest to European policy makers. In fact, less than 24 hours after the EEA first posted an initial heat wave risk map on the Eye on Earth website, it received more than 100,000 views. Story Map coupling climate model predictions of hot days and warms nights with population density throughout Europe. Given that elderly people are particularly vulnerable to climate change, clicking on a map symbol shows what percentage of the population was 65 or older in 2004. What are the implications for scientific researchers in the geospatial realm? Scientists are normally concerned with how the Earth works. But the dominating force of humanity on the Earth begs the question of how the Earth should look, especially with regard to landscape architecture, urban planning, land use planning and zoning, and ocean/coastal management. These involve decisions that must be made by policy makers and require the use geospatial data and geographical analysis. And along these lines, geodesign will continue to make an impact in the sustainability world, leveraging geographic information and scientific modeling so that future designs for urban areas, watersheds, protected areas, and the like will more closely follow natural systems and result in less harmful impacts. How should geospatial scientists communicate this to policy makers? Given the challenges that our planet faces, I hope the geospatial community will also ponder and discuss whether communicating with policy makers is now an ethical issue, and if science communication should be made a formal part of geospatial curricula and professional GIS certification.